Comprehensive eye exams for adults and children, co-management of laser vision correction surgery, caring for eye emergencies and so much more. 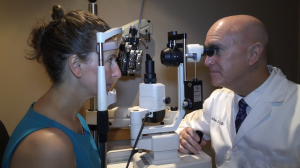 The optometrist in Shaw Eye Care provides comprehensive eye care to patients of all ages including treatment for a range of conditions including glaucoma, diabetic retinopathy, dry eye, cataracts and macular degeneration. Before being fit with contact lenses, a comprehensive eye exam for contact lenses is performed. In this exam, Dr. Shaw determines your prescription for corrective lenses and checks for any eye health problems or other issues that may interfere with successful contact lens wear.